Explanation: The Earth's surface is broken. Cracks in the Earth's crust known as faults can run for hundreds of kilometers. These faults are frequently the sites of major earthquakes as the tectonic plates that cover the surface of the Earth shift. Pictured above is San Andreas Fault in California, one of the longest and most active faults. Visible as the linear feature to the right of the mountains, San Andreas Fault reaches 15 kilometers deep and is about 20 million years old. The above exaggerated-height image was created by combining radar deployed by the Space Shuttle Endeavor in February with a true-color Landsat picture. 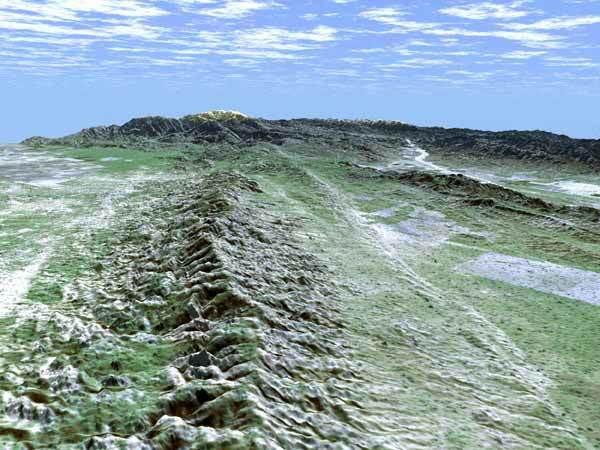 Along San Andreas Fault, the titanic Pacific Plate is shifting relative to the huge North American Plate by an average of a few centimeters per year. At that rate, in a few million years, the Earth's surface will look quite different than it does today.